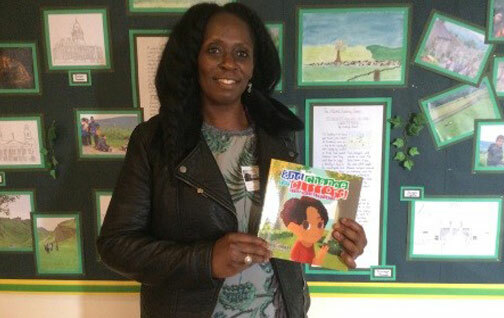 On Friday 10th September we had a visit from Deloris Herbert who is a local author. She has written ‘2nd Chance for Clifford – Kind Hand Approach’. At Hillcrest every class has been reading her book as part of their SMSC work on understanding right from wrong and being able to apply this in their everyday lives. The children were surprised to see the author of their current book standing in assembly. The story is about a young talented boy who loved school and excelled in everything he did. One day he was surrounded by bullies who were cruel and mean to him. They judged him because he looked different from them. The book tells readers how Clifford pushed past adversities and understood how being different made him unique. He chose to do what was right and helped other children who struggled with confidence. During our assembly Deloris told the children all about her book and why she wrote it. She also told them about her recent visit to Nevis in the West Indies. She talked to them about being confident to speak to someone about problems they might be having in school. Deloris ended her talk by telling the children how wonderful they were and what a pleasure it was for her to visit Hillcrest Academy. Deloris has just started writing her second book.